Bahraini people will never forget what happened Saturday morning and the afterward events. The morning that witnessed Bahrain king’s approval to execute three innocent young men over a story fabricated by his Royal Court. The next dawn, Bahraini authorities executed the defendants with the support of Saudi Arabia, United Arab Emirates and others. Why has the execution sentence been issued? How the fabricated charges against Abbas Al-Samea, Ali Al-Singace and Sami Mushaima brought them to the guillotine of execution. On March 3, 2014, Bahraini authorities announced that three soldiers were killed along with an Emirati officer in a bomb blast it said went off in Diyya town north of the country. Bahrainis still question the story. At that time, people of Diyya not only didn’t hear any sound that resembles the sound of explosion, but also said that the four military personnel in subject were killed by a bomb blast that was in the possession of the UAE officer who was involved in the suppression of Bahrainis inside their safe villages. Hours later, Bahraini interior ministry arrested “a number of the perpetrators of the bombing.” Prior to any investigation, their photographs were displayed on the state television, which claimed their responsibility for the incident! Inside the prison, torture was a daily meal for three detainees. They had to be forced to confess and save face for Bahrain with the UAE. Bahraini authority wanted to close the case by a “punishment” that satisfies Emirati people without asking: What was our officer doing in Bahrain? What was the Emirati military doing against the unarmed people of Bahrain? 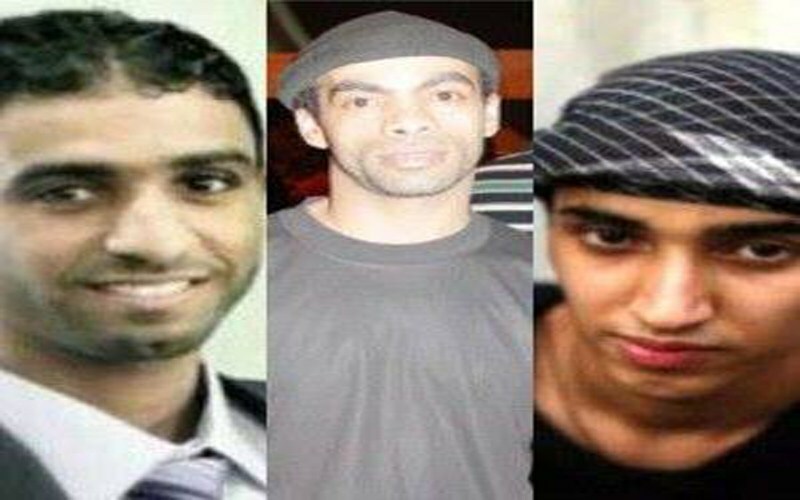 Samea was arrested along with his four brothers, Sami Mushaima was arrested with his two brothers, in addition to Ali Al-Singace and a tenth detainee. Upon holding the trial, defense lawyers presented a document issued by the school where Samea works as a sports teacher, proving that he was at school the time of the bombing. However, the court ignored the document, stripped Samea of his citizenship and sentenced him to death. Regarding the case of Mushaima, the court rejected the testimonies given by some twenty witnesses who reported that he was at home at the time of the bombing. The court did not approve the statements, but stripped him of his citizenship and sentenced him to death. As for Singace, his mother confirmed that he had not been investigated on the killing of the UAE officer. Her son hadn’t been asked about the blast immediately after his arrest on April 2, 2015 in the town of Diraz, but was forced to sign papers stating that “he acknowledges his responsibility for the Diyya bombing.” On that day he was sentenced to death. Last Friday, Bahraini judiciary approved the execution sentence, soon the King signed it, and the sentence was carried out Sunday dawn on January 15. Four bullets pierced the heart of each of Samea, Mushaima and Singace. Later on, activists circulated photos of the three young men laid down over the bather. Mushaima’s photo took everyone who saw it back to his words at the Pearl Square in 2011, when he was asked by the Bahraini activist Abdulhadi al-Khawaja about a previous arrest: After the torture you suffered, would you continue or not? Smiling and full of confidence Mushaima replied: I will continue to death! Mushaima’s mother recalled her visit to him in prison after the last detention, his face was puffy and toothless, and effects of burns were clear on his hands… This is how Mushaima was forced to sign fabricated confessions. Singace’s name, who refused to collaborate with the regime, appeared for the first time on media in 2012 when he was 15 years old. At the time he was found lying in a garage of his town of Sanabis, stripped of his clothes. Later, After refusing the regime’s offer, he was threatened, a charge was fabricated against him and was sentenced to 5 years in jail. He spent his days fugitive and wanted, before his body knew stability in the Mahooz cemetery after he was executed. At midnight on Saturday, regime authorities summoned a turbaned man dispatched by Bahrain’s Interior Ministry to the prison. However, he did not meet the three young men before 03:00 a.m. The turbaned man talked to the three youths, he was quoted as saying that he found them ready for the execution, he asked them to express their last demands. Singace and Samea asked to pray and to write their wills. He brought to them papers and pen. “Martyr teacher Abbas [Samea],” as his mother would like to call him, asked to call his parents to say goodbye for the last time, but was rebuffed. Mushaima couldn’t be able to write his will. the 40-year old man does not know how to write, he recited the will verbally before the turbaned “Sheikh”, hoping it will reach his parents and siblings. 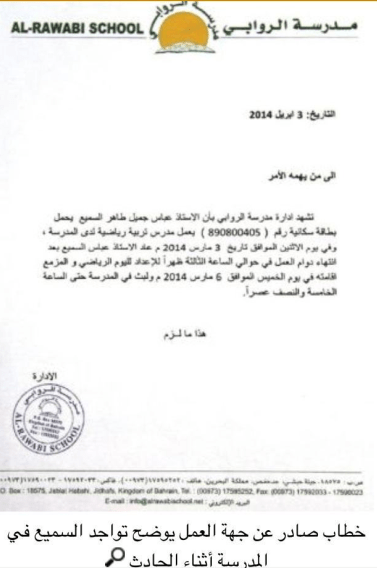 So far, families of the martyrs have not received the wills and belongings of their children. No one will be able to know what Samea and Singace wrote and what Mushaima said before condolences ceremonies end. Until today, they only narrate the commandments they had heard from their children: “If people want to win, they will have to stand before the oppressor and sacrifice what they have” Not a right is obtained without sacrifices, Not a nation is build without sacrifices.